Head in hands. That sums up his performance tonight as I went to watch him and Brazil take on Russia in a friendly match at a freezing cold Stamford Bridge in London. Things have been a bit quiet here on Brazilfooty recently but I sprung back into action tonight as a friend who works at Chelsea kindly arranged free tickets for me and three friends to go. And with an excellent pre-match buffet including Brazilian steak, beer and pretty much anything else you could want, we watched the match in style! As for the game, I was disappointed with Brazil. This looked just like one of the tame, lame performances we saw under Mano Menezes. In fact, things were getting a bit better with him and now it’s back to the drawing board with Big Phil. I saw nothing tonight that gives me any confidence they will go on and win the World Cup at home next year. Where are Brazil ranked in the World at the moment? 18th? Shocking for Brazil but you cannot argue they are any better that. Apart from a shortish spell in the first half and a great last five minutes, in which substitute Hulk was the tormentor-in-chief, Brazil were poor. The comeback was good and if the match had gone on for another five minutes, Brazil probably would have won. But, aside from that, really, they can consider themselves lucky not to lose. That most Brazilian of qualities, creativity, was the main ingredient which was lacking again and their midfield looked mediocre. It seemed to be a 4-4-2 with Kaká on the left and Oscar on the right. I didn’t think either played well. Neither of them are wide-men so that’s not surprising really. Kaká was laboured and Oscar was insipid. The central midfield pairing of Fernando and Hernanes was boring. The most threatening moments came when the full backs Marcelo and Dani Alves pushed forward and got crosses in. But mostly the Russians dealt with that comfortably. When Brazil did get on top in the match, Russia put ten men behind the ball. Brazil weren’t creating those little triangles that you need to do in order to open up teams who are sitting back. When Kaká or Oscar got the ball their only real option was to pass it back to Hernanes or Fernando who would then probably give to Thiago Silva or David Luiz. Boring. It wasn’t terrible but it wasn’t fluid at all. There were quite a few Brazilian fans in the crowd, as you would expect in London, but they were getting restless. You could argue that the Brazilians in the stands were showing more effort than their countrymen on the pitch with some impressive Mexican waves taking place behind the Russian goal. We deserved more. But at least we got a live samba show with some seriously scantily clad Brazilian babes outside the stadium before kick-off. With the temperature at about zero degrees I really felt quite sorry for those women! Shouldn’t really have been allowed. 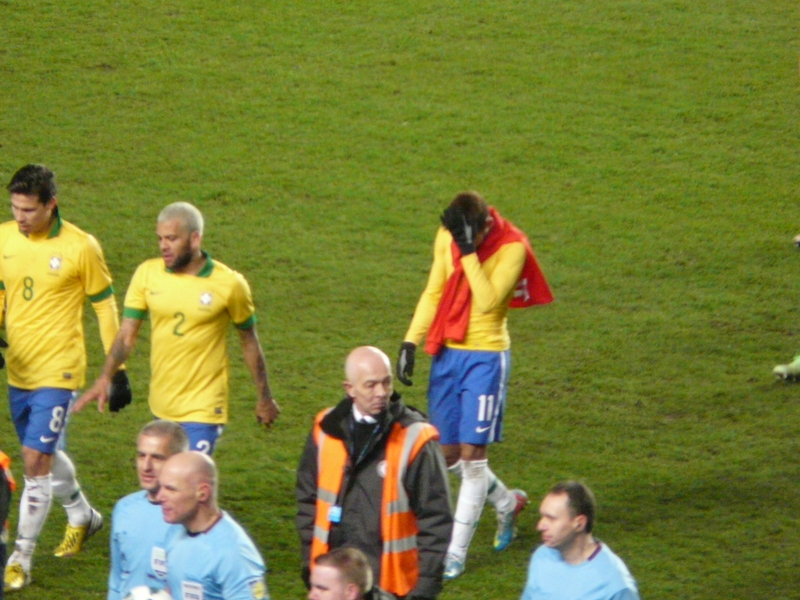 Perhaps Neymar felt the same way because he was completely off the pace tonight. A player with so much talent, which I have seen first-hand in Brazil, his performances recently have been poor. In my role as a backseat punter these days I’m starting to feel he has stayed in Brazil too long. At his age Ronaldo was destroying defences for Barcelona and was lighting up the world. Neymar is currently playing the São Paulo state Championships against mediocre defences. The only thing he is lighting up on the world stage are youtube compilations of his best skills that only Brazilians (and the odd intrepid gringo like me) have ever seen in the flesh. He is not delivering on the World stage. I keep telling my non-Brazilian friends just how good he is. But, he failed against England and failed miserably tonight. Simple passes were going wrong and at one point just fell over when trying to change direction. That summed it up for me. Four out of ten. His form domestically has been poor recently. He is a young lad and enjoying his life. Fair enough. But is he enjoying it too much? He’s only 21 and has a child already. He’s just got a new hot actress girlfriend (who is not the mother of his child). He enjoyed the Carnival recently and complained about having to play a match instead of being able to party more. Santos aren’t in the Libertadores this year. He was off the pace. Will he get back on the pace? In the greater scheme of things, this was just a friendly match against Russia on a cold night in London. It’s easy to see how he could not be particularly motivated for this. But at the moment he looks to be going in the same direction as Robinho and not that of Pelé. Harsh. Yes, but if you want to be compared to the greatest player of all time (well, except for Maradona, possibly), you have to be harsh. To even be mentioned in the same breath as Pelé you need to be harsh. Has Neymar been over-hyped? Are Brazil putting too many hopes on him? At the beginning of the match every time he got the ball you could hear the expectation. When he repeatedly gave it away you could hear the frustration. The answer to both of those questions is a definitive yes. I just hope he starts getting focused again, for club and country. Brazil need more from him. A fit and on form Paulo Henrique Ganso would help not only take the pressure off Neymar but provide some much needed ammunition for him too. Something his team mates aren’t very good at doing at the moment. The problem is, PH Ganso is never fit or on form anymore. That is an even bigger shame. Whoever is on the pitch though, Brazil need to improve their game and need to improve their tactics. For all Felipão’s charm and personality, I’m not sure he is really up to that task anymore. Check out the match photos on Facebook here. Leave a comment below – join the debate! This entry was posted in Match reports, Seleção and tagged Brazil, Neymar, Russia, Stamford Bridge by Brian Davidson. Bookmark the permalink. It was a 4-2-3-1, Brian. Kaká was inside, Neymar was left and Oscar was right. Fred was the centre-forward. Also, as for the ranking: Brazil is not currently playing the South American Zone qualifiers, and only plays friendlies. The current format of the ranking gives more points on official matches than in friendlies, so Brazil is being “penalized” for being the host team in the next World Cup. I am not confident too. I really thought that, if Mano was still in the job, we would be at a better form. You said it all: back to the drawing board with Felipão. I don’t like the style of football he puts on, also. To me, it was getting backwards — mainly in the tactical field. But the fact we are going to play home is important. We should at least balance things with the better teams because of that. The Confed Cup will be a good test to see that! Técnico ultrapassado e jogadores pipoqueiros. O Brasil empatou com duas seleções fracas e não foi feito nenhum teste. Só serviu para calar a boca de quem critica o Hulk (que pelo menos na seleção tem jogado muito mais do que Oscar, Neymar, Lucas, Kaká, Ronaldinho Gaucho, Damião, etc). E o Daniel Alves não joga de titular nem no Juventus da Móoca. Deve ser muito amigo do presidente do Barcelona. Neymar is a very talented player but he is not a finished airticle by any means. He needs to improve his decision making skill and has to be more of a team player.He has shown is quality in some of the international matches but not consistently enough. I think he needs support form his team mate and coach. there is too much expectation from him as a results there is a lot of pressure on him. I think the pressure on him has some impact on his performance on big stage. I am not sure why Brazilian expect that Neymar on his own can change the game. Whole team has to put their effort and work as unit to get best out of the talents of Neymar, Oscar , Lucas and others. Brazil needs to improve on defense and quick passing in order to be more effective against stronger team. I am not to sure about David Luiz as a defender. David Luiz is a talented player but sometime he makes wrong decision and appear to be lazy ! Which can be very costly in competitive match . Brazil need to find a solution for defense. I think Dante would be a better option in place of David Luiz and Luiz can move up in defensive midfield . I hope Ganso become fit and find his form to join Selecao . He can provide defense splitting pass for the forwards. Also think Scholari should give chance to Willian, Cutiniho, Fernandinho and Pato . Do you know where to find table of Acreano Second Division? And other lower state championships? also have you book-marked to see new stuff on your website.